Please see the information below detailing how the subjects of the National Curriculum and Early Years Foundation Stage curriculum are taught in school. Please click on the link below to view the Whole School Curriculum by Subject and Year Group, and also refer to each Year Group’s Curriculum Letter which explains the content in further detail on a termly basis. To achieve well in the future, academic success is of paramount importance; and this begins right from the Foundation Stage and continues through to Year 6. We plan and deliver a personalised learning experience based upon a clear understanding of the individual needs of each and every child and their potential, and provide the most appropriate opportunities for them to achieve this. We have a dedicated team of highly experienced teaching staff who deliver an exciting, stimulating, broad and balanced curriculum, based upon the Early Years Foundation Stage curriculum and the subjects of the National Curriculum at Key Stages 1 and 2. Teaching and learning in the Foundation Stage is part of an ongoing cycle. It begins with observing what the children can do along with what they are interested in, recognising that every child is unique. This information is then used to plan an exciting, engaging curriculum led through: playing and exploring, active learning and creating and thinking critically. Progress is reviewed regularly through assessment and observations of each child, so that all children receive a personalised learning experience and are ready for their transition into Key Stage 1. Throughout Key Stage 1 and 2, English and Maths lessons are taught on a daily basis; and RE and PE are taught weekly. The other subjects of Science, History, Geography, Music, Art, DT, Computing, PSHE and French are delivered in modules throughout each term. Clear links are made between the different subjects and pertinent connections are made between English and Maths and all other subjects, so that children’s literacy and numeracy skills are developed across the curriculum. Combining this with children’s own individual skills and interests, we provide each pupil with a relevant learning experience irrespective of the stage that the children are in their development. The teaching phonics begins in the Foundation Stage using ‘Letters and Sounds’, supported by the use of Jolly Phonics and a range of fun, stimulating games to help children begin to learn to read and write. The teaching of phonics continues throughout the Foundation Stage and Key Stage 1, systematically, progressively and regularly so that by the end of Year 2 or early Key Stage 2 almost all children will be ready to move into the KS2 Spelling programme. Speaking and Listening, Reading, Writing, Spelling, Grammar, Punctuation and Handwriting are progressively developed as children make their way through the school. Throughout KS1 and 2, the English curriculum is delivered in units of work lasting on average for three weeks per unit. The first week of the unit is spent focussing on developing children’s reading and comprehension skills and finding out about the text genre and its features. 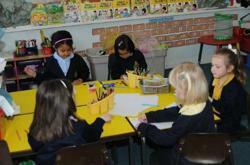 The second week of the unit focuses on developing the children’s writing skills in that particular focus genre. Teachers give clear feedback as to how children can improve their writing and pertinent links are made with improving the children’s grammar, punctuation, spelling and vocabulary skills. By the third week of the unit, the children are ready to write independently for an extended period of time in the focus genre. Their final piece of writing is assessed and feedback is given to each child as to how well they have done and what they need to do to improve further. Individual targets are then set for the next unit of work, and children are encouraged to self assess against their targets for improvement. Literacy skills are not just taught during English lessons but are evident in many other areas of the curriculum. It is not confined to school either and the elements of Homework, weekly spellings and the Library / Home reading book are key instrument to children’s development in Literacy. The importance of Mathematics is well recognised in making sense of the world around us. We encourage practical investigation and place emphasis on children’s ability to calculate mentally and using written methods and then applying these to different every day contexts. This involves children knowing their number bonds and their times tables, so that they can use these to aid their mental strategies. The Maths curriculum is taught on a modular basis and revisits key concepts on a termly and yearly basis reinforcing and then building on previously taught skills. The children are taught a range of calculation methods to deepen their understanding of number, and the school’s whole school Calculations Policy ensures that continuity and progression of skills are built up as each child moves through the school. During daily maths lessons, children will experience whole class interactive teaching, as well as working in groups, with partners and carrying out tasks independently. Real life problems will be used, where possible, for investigations and to put the topic into a real context. For further information about the school curriculum please open the link near the top of this page.